Dazzling Great Room Plan on Oversized Homesite. Garden-like setting on tree-lined street. Beautifully Updated Interiors t/o this Highly Desirable 3 Bedroom 3 Bath Home, w/three way split. Two Master suites with a secondary Bedroom plus a Den. Up to date Shaker Cabinetry w/all the Bells & Whistles & Gorgeous Backsplash in Kitchen, Granite Counter Tops t/o, Custom Tubs & Showers, 5.5 in Baseboards, plus Custom Lighting. High-end GE Appliances including Refrigerator & Wine Cooler. The Arizona Room features opening Wall of Glass plus a Fireplace overlooking Pergola & Water Feature in Rear Yard. Built-in BBQ, extended Patio/Deck Area for Entertaining, Plus Large Lawn on one side, & Double RV Gates w/Slab on the other. 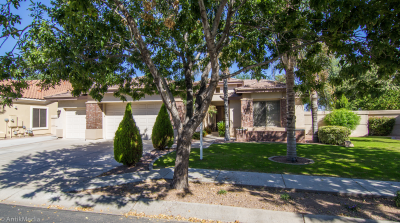 Incomparable Alisanos Location w/Easy Access to the Valley! It's All Here!